Printed circuit boards are largely used in various industries due to its ability to reduce errors associated with routing and assembly and enhance the competence of automation and fabrication. PCBs are in various categories based on different classification standards. Today, let’s analyze from the perspective of PCB substrate material. Rigid PCBs-- They have an unbendable solid base material. A good example is glass fiber. Rigid PCBs in fact make up most boards. Flexible PCBs--They have a flexible base material which can form in different shapes. They are best used for a creating a solid linkage between electronic boards. Such links can in fact be repeated. Flexible PCBs can largely reduce heavy routing and board’s weight, and handle with harsh conditions. Flexible-layer PCBs can be used in aerospace as well as in the military. This is because they can use to create military devices that can stand harsh conditions such as high temperatures or high density. This type of PCBs can be used for designs that require flexibility. It however has the ability to also protect parts of a design that do not require such flexibility. 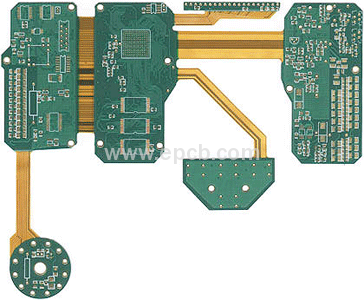 It allows the connection of a flexible PCB to a hard multilayer PCB board.